A "Jiroft culture" has been postulated as an early Bronze Age (late 3rd millennium BC) archaeological culture, located in the territory of present-day Sistan and Kermān Provinces of Iran. 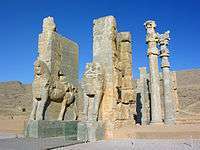 The hypothesis is based on a collection of artifacts that were confiscated in Iran and accepted by many to have derived from the Jiroft area in south central Iran, reported by online Iranian news services, beginning in 2001. The proposed type site is Konar Sandal, near Jiroft in the Halil River area. Other significant sites associated with the culture include; Shahr-e Sukhteh (Burnt City), Tepe Bampur, Espiedej, Shahdad, Tal-i-Iblis and Tepe Yahya. The proposition of grouping these sites as an "independent Bronze Age civilization with its own architecture and language", intermediate between Elam to the west and the Indus Valley Civilization to the east, is due to Yusef Majidzadeh, head of the archaeological excavation team in Jiroft. He speculates they may be the remains of the lost Aratta Kingdom, but his conclusions have met with skepticism from some reviewers. Other conjectures (e.g. Daniel T. Potts, Piotr Steinkeller) have connected the Konar Sandal with the obscure city-state of Marhashi, that apparently lay to the east of Elam proper. Many artifacts associated with Jiroft were recovered from looters described as "destitute villagers" who had scavenged the area south of Jiroft before 2001, when a team led by Yusef Majidzadeh began excavations. The team uncovered more than two square kilometers of remains from a city dating back to at least the late 3rd millennium BC. The data Madjidzadeh's team has gathered demonstrates that Jiroft's heyday was from 2500 B.C. to 2200 B.C. The looted artifacts and some vessels recovered by the excavators were of the so-called "intercultural style" type of pottery known from Mesopotamia and the Iranian Plateau, and since the 1960s from nearby Tepe Yahya in Baft. The "Jiroft civilization" hypothesis proposes that this "intercultural style" is in fact the distinctive style of a previously unknown, long-lived civilization. This is not universally accepted. Archaeologist Oscar Muscarella of the Metropolitan Museum of Art criticizes that the excavators resorted to sensationalist announcements while being more slow in publishing scholarly reports, and their claims that the site's stratigraphy shows continuity into the 4th millennium as overly optimistic. Muscarella does nevertheless acknowledge the importance of the site. Earlier excavations at Kerman were conducted by Sir Aurel Stein around 1930. One of the most notable archaeological excavations done in Kerman Province was one done by a group led by Professor Joseph Caldwell from Illinois State Museum in 1966 (Tal-i-Iblis) and Lamberg-Karlovsky from Harvard University in 1967 (Tepe Yahya Sogan Valley, Dolatabad). Archeological excavations in Jiroft led to the discovery of several objects belonging to the fourth millennium BC. According to Majidzadeh, geophysical operations by French experts in the region indicate the existence at least 10 historical and archaeological periods in the region belonging to different civilizations who lived in this area during different periods of time in history. According to the French experts who studied this area, the evidence remained from these civilizations may be traced up to 11 meters under the ground. "What is obvious is that the evidence of Tal-i-Iblis culture in Bardsir can be traced in all parts of the region. Tal-i-Iblis culture, known as Ali Abad period (fourth millennium BC) was revealed by Joseph R. Caldwell, American archaeologist," said Majidzadeh. The primary Jiroft site, consists of two mounds a few kilometers apart, called Konar Sandal A and B with a height of 13 and 21 meters, respectively (approximate location 28°30′N 57°48′E﻿ / ﻿28.5°N 57.8°E﻿ / 28.5; 57.8). At Konar Sandal B, a two-story, windowed citadel with a base of close to 13.5 hectares was found. Helmand culture of western Afghanistan was a Bronze Age culture of the 3rd millennium BC. Some scholars link it with Shahr-i Sokhta, Mundigak, and Bampur. The term "Helmand civilization" was proposed by M. Tosi. This civilization flourished between 2500 and 1900 BC, and may have coincided with the great flourishing of the Indus Valley Civilization. 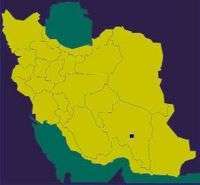 This was also the ﬁnal phase of Periods III and IV of Shahr-i Sokhta, and the last part of Mundigak Period IV. Thus, Jiroft culture is closely related to Helmand culture. Jiroft culture flourished in the eastern Iran, and the Helmand culture in western Afghanistan at the same time. In fact, they may represent the same cultural area. Mehrgarh culture, on the other hand, is far earlier. The inscription, discovered in a palace, was carved on a brick whose lower left corner only has remained, explained Yusef Majidzadeh, head of the Jiroft excavation team. "The two remaining lines are enough to recognize the Elamite script," he added. "The only ancient inscriptions known to experts before the Jiroft discovery were cuneiform and hieroglyph," said Majidzadeh, adding that" The new-found inscription is formed by geometric shapes and no linguist around the world has been able to decipher it yet." Archeologists have found many artifacts confirming the existence of a rich civilization dating back to the third millennium BC, during the 5 previous excavational phases. The sixth phase of Jiroft excavations will focus on the temple and the sites where the tablets were found during previous phases. Archeologists believe the discovered inscription is the most ancient script found so far and that the Elamite written language originated in Jiroft, where the writing system developed first and was then spread across the country. Other scholars have called the authenticity of the cyphers into question, suggesting they may be examples of several modern forgeries in circulation since the earlier looting at the site. Wikimedia Commons has media related to Jiroft culture. ↑ Oscar White Muscarella, Jiroft (2008), in: Encyclopedia Iranica. "For archeological accuracy the terms "Jiroft" or "Jiroft culture" employed to define a specific ancient Iranian culture and its artifacts should only be cited within quotation marks. All the artifacts known to date that are accorded the Jiroft label have not been excavated; they have in fact been plundered." O. White Muscarella, Jiroft and "Jiroft-Aratta": A Review Article of Yousef Madjidzadeh, Jiroft: The Earliest Oriental Civilization, Bulletin of the Asia Institute 15 (2005) 173-198. Andrew Lawler, Ancient Writing or Modern Fakery?, Science 3 August 2007: Vol. 317. no. 5838, pp. 588 – 589. Andrew Lawler, Iranian Dig Opens Window on New Civilization, Science 21 May 2004: Vol. 304. no. 5674, pp. 1096–1097.